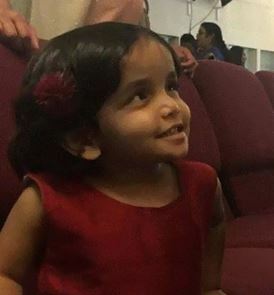 Sherin Mathew, 3, was missing after her father, Wesley, told her to stand outside at 3 a.m as punishment for not drinking her milk. He then wnt ouside 15 minutes later and she as gone. The authorites were alerted five hours later and the parents told police that maybe coyotes got a hold of her. Her body was later found 15 days later and Wesley changed his story according to USA Today. HE told police that he “assisted” with pouring milk down her throat, she choked and then died. Mathews was adopted about a year ago from India according to WFAA. she was abandoned by her birth parents. Wesley has been charged with felony injury to a child and remains in jail on a $1M bond. A candlelight vigil that was set for today was canceled due to tension amongst groups and individuals.